The final read for my Thomas Hardy reading challenge – and one of two books of stories that I read for the first time during the project. 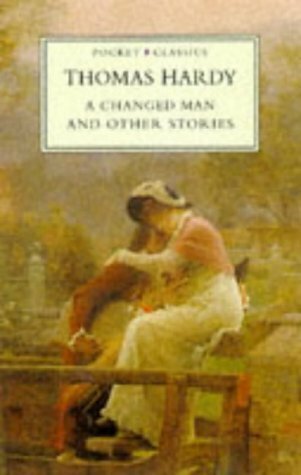 The stories which make up A Changed Man were written at various points during Hardy’s life, but this collection wasn’t published until 1913. Hardy wrote really excellent short stories – many of his stories having the scope and complexity of a full length novel. This collection of twelve stories; tales of soldiers, shepherds, milkmaids and Dukes, often feature some elements of the eerie or supernatural to some degree. They are not really horror or ghost stories like those of Poe or M R James – but many contain deliciously little elements of darkness which never threaten to get too absurd. At the risk of repeating myself – ok I know I am repeating myself, I always find reviewing short stories really difficult. Hopefully I can give a flavour without banging on about each of the twelve. The title story set in Hardy’s famous Casterbridge is the tale of a handsome young hussar captain, who resigns his commission to become a preacher, taking a living in a small poor parish. His new young wife, having always been attracted to the glory and pageantry of the military is horrified, decides to leave her husband for another soldier, only things don’t end quite as she would have imagined. The narrative of several stories take place over a number of years, including The Waiting Supper – a wonderfully engrossing story of a socially mismatched couple who separated when very young – are destined to come together again fifteen years later, only to find their intention to finally marry thwarted by the shadow of the past coming back. Hardy is a master at creating a whole world within just thirty or forty pages, individuals and whole communities deftly portrayed within those themes which will be recognisable to Hardy fans. One of my favourite stories; What the Shepherd Saw – also has a narrative scope of several years, an uneducated shepherd boy left alone in a hut to mind the sheep – is witness to a strange meeting between a Duchess and her cousin, the following night the cousin is met by the Duke, the Duchesses jealous husband. The result of that night – and what the shepherd saw will echo down the years as the Duke later becomes the shepherd’s patron in return for his loyalty and silence. The final story of the collection, another favourite, is also the longest, running to some eighty pages. “She stooped into the opening. The cavity within the tree formed a lofty circular apartment, four or five feet in diameter, to which daylight entered at the top, and also through a round hole about six feet from the ground, marking the spot at which a limb had been amputated in the tree’s prime. The decayed wood of cinnamon-brown, forming the inner surface of the tree, and the warm evening glow, reflected in at the top, suffused the cavity with a faint mellow radiance. The Romantic Adventures of a Milkmaid (no dark elements here) is set firmly in Hardy’s pastoral landscape of Wessex – and features a kind of romantic triangle. Margery – the milkmaid of the title meets and helps a foreign baron, who promising her a gift of anything she would like, finds himself having to treat the girl to a ball, decking her out in finery hidden in a hallowed out tree and whisking her off to a dance under an assumed name. This Cinderella like fairy-tale silliness is quite unusual, but Hardy does it really rather well. Of course there is much to complicate the situation, as Margery has a good honest young suitor in Jim Hayward, but the silly girl has had her head turned, and the baron unwittingly causes mayhem in getting Margery to make him an innocent promise to assist him whenever he should require it. I found it very hard to put this down – just not quite able to finish it in one sitting though I really wanted to. The Romantic Adventures of a Milkmaid was actually a lovely light bright note on which to finish this project. I finally read and reviewed this in July http://librofulltime.wordpress.com/2014/07/29/book-reviews-114/ but forgot to come back to this saved post. I loved the final story, too, and I felt the gothic elements in other stories tied us back to the very first stories we read at the beginning of the project. I’ve really enjoyed doing this, and am pleased that I eventually managed to read EVERYTHING! Yay! It was a great project.